Are you a selfie addict? Come on, just admit it, we all do it and it’s nothing to be ashamed of! You could take photo after photo of New Zealand’s beautiful scenery, but looking back and seeing yourself in the moment against that stunning backdrop tells a much better story. To make capturing awesome selfies super easy, we’ve put together a list of the top ten New Zealand selfie spots. There’s a few hidden gems in this list that are off the beaten track, so if you’re keen for an adventure along the path of the less travelled, read on. Counting down to the absolute best selfie spot, jot down these ten unmissable locations! Selfie at the Hobbiton Movie set. 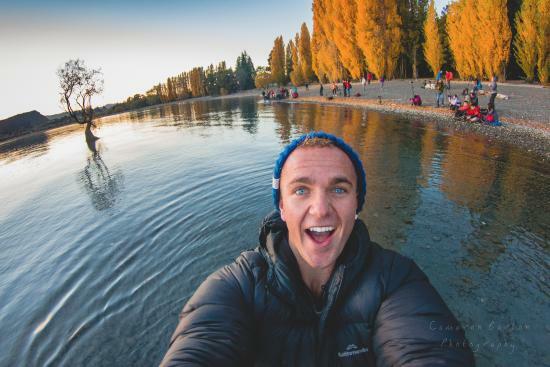 Our number 10 in this countdown of New Zealand selfie spots is awesome in its own right! Home of the Hobbits and the Lord of the Rings trilogy is the incredible Hobbiton Movie set. Located in the heart of the Waikato on a picturesque 1,250 acre sheep and beef farm sits this unique attraction. See with your own eyes Middle-earth, the cute Hobbit Holes and the green rolling hills of The Shire. Prove to friends and family that you made the epic mission to Middle-earth by capturing heaps of selfies! Why not book a tour with InterCity to learn more about this world-famous attraction with a guide’s entertaining and informative commentary. You’ll earn major street cred taking selfies at the northernmost and southernmost spots in New Zealand! Take away proof that you’ve ‘done’ New Zealand top to bottom with selfies by the famous signposts at each end. At both locations you’ll find signposts showing the direction of and distance to the world’s major cities. 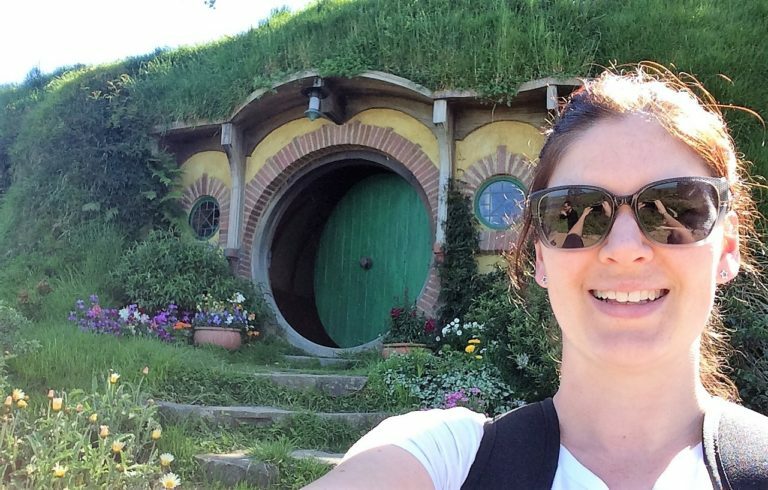 To capture both of these selfies is an incredible feat, which is why it hits our list of New Zealand selfie spots at number nine! Most of the places on our list have been sweeping natural vistas, but here’s a man-made item coming it at number eight. The Len Lye Centre in New Plymouth is home to an outstanding collection of film and kinetic art by artist Len Lye, but the building is art in itself. 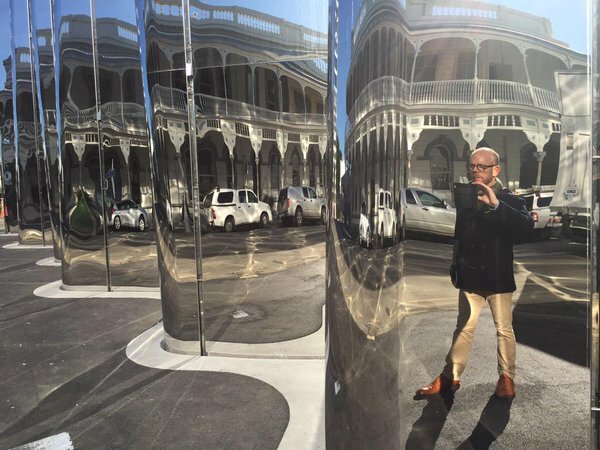 A cheeky selfie in front of its mesmerising mirrored curves reflects what’s going on behind you, so make sure you check for photobombs before you post! 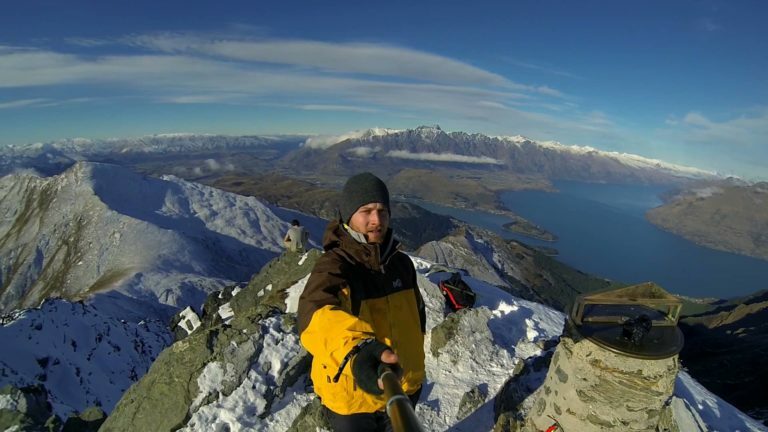 Number six on our list of New Zealand selfie spots is high atop the mountain Ben Lomond. The five-hour return hike up one of the highest peaks in Queenstown’s Wakatipu Basin is well worth the effort year-round. Reaching the summit, you’re greeted with outstanding panoramic views of rugged mountains and the winding blue waters of Lake Wakatipu. Get into your activewear, stretch your legs and do it – you’ll thank us for the experience. This awesome little gem deserves more credit than we’re giving it, but as we’re running out of space it’ll have to slot in at number five. 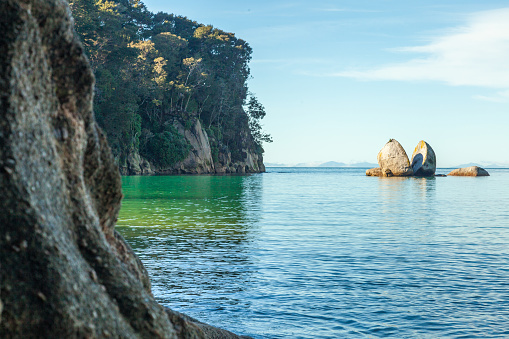 Located on the Coromandel Peninsula near Hahei, Cathedral Cove is only accessible by foot, boat or kayak. After a peaceful 35-minute walk, you’ll find a stunning white sandy beach split in two by an impressive rock arch. Of course, you might recognise this picturesque location from the second of the ‘Narnia’ movies. Even if there’s no portal to another world, a trip to Cathedral Cove is a relaxing and interesting way to spend a summer’s afternoon. Lake Tekapo is an absolute must-stop spot for anyone, let alone avid selfie takers. Situated in the centre of the South Island and three and half hours from either Christchurch or Queenstown, the unique turquoise colour of the lake, surrounded by the Southern Alps, make it a breathtaking sight. Not only is Lake Tekapo pretty when the sun is shining, as soon as the sun goes down it takes that beauty to a whole new level. Part of the International Dark Sky Reserve, at night the glistening stars come to life in the dark black skies. Take a selfie night or day at this impressive spot. Descending down the spiralling track toward Piha Beach you’re treated to several amazing selfie spots before you even arrive. Pull over, pull out that camera and snap that selfie. The dramatic black sand that adorns this wild black sand beach on Auckland’s west coast is a stunning focal point against the aggressive crashing waves that Piha is famous for. Be sure to include the giant Lion Rock in your selfie to maximise likes. 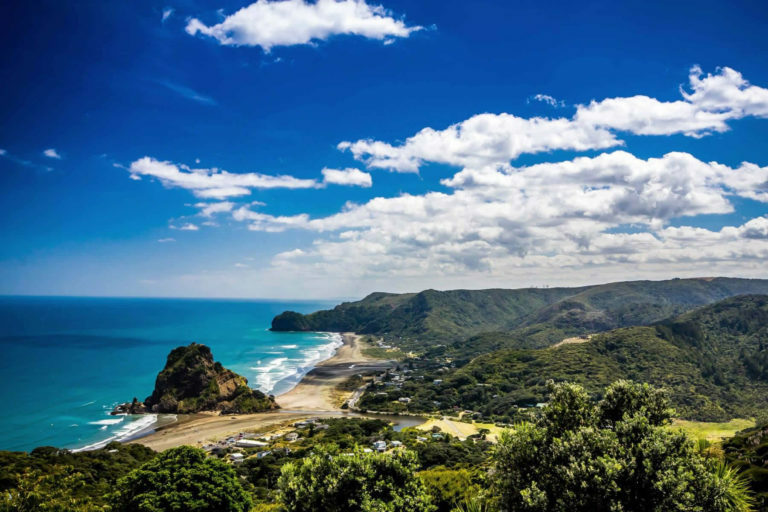 Piha’s also great for swimming – just don’t forget your jandals, that black sand can burn! Our second best selfie spot in the whole of New Zealand has to go to Milford Sound. Located in the southwest of the South Island, Milford Sound is a fiord with unparalleled beauty. It’s an untouched, pristine destination with spectacular waterfalls, lakes, rugged mountaintops, ice-carved fiords, unique dense rainforests and an abundance of wildlife. There’s something to marvel at around each and every corner. Make sure your camera is fully charged as you’ll be snapping pictures and selfies constantly! You can reach Milford Sound by driving there yourself, however, if you want to sit back and optimise your viewing pleasure you can do so in a luxury, air conditioned glass-roof coach with awesomeNZ or GreatSights New Zealand. Operating year round, these two local groups provide entertaining and informative commentary from an experienced driver. Make a day of it and capture some memorable selfies in Milford Sound and tick this extraordinary place off your New Zealand bucket list! New Zealand’s fourth-largest lake and one of the most beautiful is crowned as the winner in this list of New Zealand selfie spots! Lake Wanaka is a spectacular sight to behold with its deep dark blue waters reflecting the stunning backdrop of snow-capped mountain peaks. Not only that, but a world famous willow tree delicately stands ground within the lake, alone yet determined to stay. With its very own Instagram hashtag, at least one of your selfies has to feature this famous landmark, #thatwanakatree – you’ll be insta-famous in no time! We double dare you to take a selfie at every single one of these fabulous New Zealand selfie spots. Happy selfie snapping!